Dr. Madigan offers several sedation methods for patients who have a fear of the dentist. Sedation minimizes the anxiety associated with a visit to the dentist and provides a more comfortable, relaxing, and safer experience. 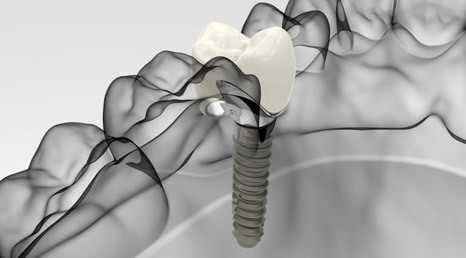 A dental implant is the ultimate technique for replacing missing teeth. The replacement tooth is not only very strong, stable, and long lasting, but also offers the comfort, functionality, and beauty of healthy teeth. Gum grafting increases the amount of attached gum tissue to reduce the likelihood of further gum recession and eventual tooth loss. It can also be used to cover exposed root surfaces and prevent or treat sensitivity. Many people exhibit a “gummy” smile or an uneven lip line when smiling. A gum lift, known as crown lengthening, is performed to reduce the tissue around each tooth to make the tooth appear larger. Dr. Michael Madigan and his team at Madigan Periodontics and Implant Dentistry offer services in the prevention and treatment of periodontal (gum) disease, gum recession, dental implants, cosmetic dental surgery (gum lift), and TMJ therapy. Dr. Madigan is on the cutting edge of the newest and best technology available in dentistry. Noted for the personal attention he gives patients, Dr. Madigan educates his patients on the care of their teeth. With his illustration-rich, problem-solving format, he answers patients’ difficult questions regarding the pros and cons of various treatments, their cost, and the results that can be expected. In addition, his philosophy of making procedures as painless as possible removes all the anxiety of going to the dentist. Dr. Madigan’s dedicated staff is here to give patients a comfortable and pleasant environment while ensuring complete confidentiality when it comes to the individual’s periodontal needs. His team attends continuing education courses every year to learn about unique cases and advanced technology that enhance their skills for patient care. The first step toward a beautiful, healthy smile is to make an appointment with Dr. Madigan. Contact our Knoxville or Morristown offices to schedule yours today! I highly recommend Dr. Mike. As an extremely anxious patient, he made it a priority to make me comfortable during my procedure. His knowledge and experience in this field made me confident in his recommendation for some tooth extractions, bone grafting and dental implants to prepare for bridge work. Everything went perfectly and I couldn't be more happy with the results. I am terrified of all things related to dental care and teeth. I experienced a lot of gum loss/recession after I had second degree burns in my mouth (from a teeth whitening session) become infected. I've been putting this procedure off because I hadn't met anyone yet that I felt like I could trust. Dr. Madigan and his staff are the absolute best. They've taken such great care of me. Dr. Madigan and his staff are wonderful. I cannot say enough about this establishment. After a traumatizing dental experience, he saved my teeth. He is the only person I trust fully. If you need anything done, this is where to go.